A proposed 239-unit development in San Francisco’s Hayes Valley has yet to come to fruition, leaving an ugly, empty lot in its place. 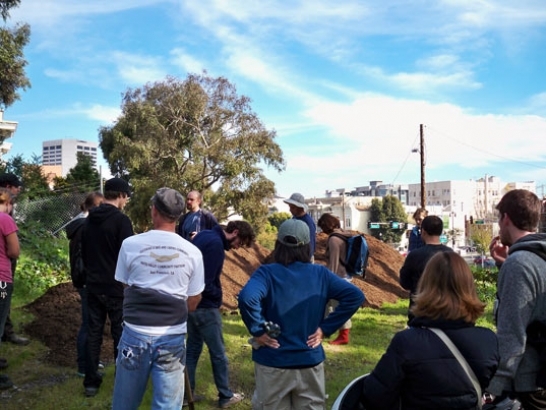 Seeing this, a group of enterprising citygoers have decided to turn the lot into Hayes Valley Farm, an education and research project sponsored by the San Francisco Parks Trust. So far, they’re doing a good job — the farm offers classes, workshops, work parties, and site tours for anyone interested. Future workshops include bee keeping, composting, greenhouse propagation, SF-specific plant selection, and garden design / edible landscaping. Unfortunately the farm won’t be around forever — it’s part of an interim use agreement with the City’s Office of Economic and Workforce Development. After two to five years, the city will move ahead with development plans for the space. Still, it’s exciting to see San Francisco allow residents to turn temporarily abandoned lots into community-oriented spaces.